Most mobile home cabinets are typically made with MDF that is wrapped or covered with one of four materials: paper, laminate or melamine, Thermofoil, and veneer. 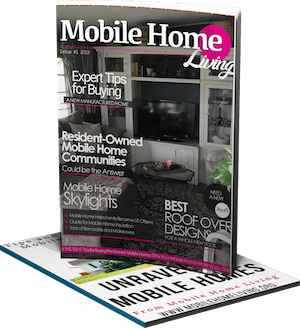 In this article, we show you how to repair mobile home cabinets that are peeling, delaminating, crumbling, or even has whole chunks missing. 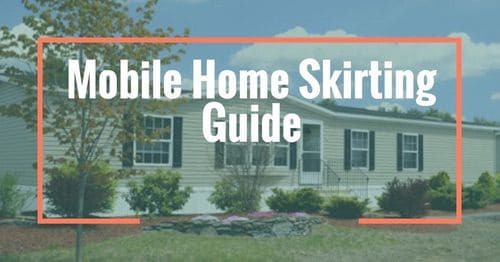 We’ll also share advice and tips from professional painters on how to paint mobile home cabinets, In addition, we’ve gathered a couple of ideas to reface and replace mobile home cabinets if repairing and painting just isn’t enough. 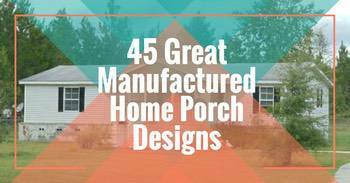 By the end of this article you will be prepared to tackle those mobile home cabinets and create the kitchen or bathroom that you’ve been dreaming about. It’s important to know what kind of materials you’re dealing with before you try to repair or paint it. Here, we cover the basics of MDF and the materials used to surface MDF when used for mobile home cabinets. Mobile home cabinetry is typically made of a smooth dense composite material called MDF which stands for medium density fiberboard. It is created by taking the scrap waste from real wood production, adding binders, and then forming it into a smooth thick sheet with a process called thermo-pressing. Though it has a bad reputation with mobile homeowners there’s nothing wrong with MDF. In fact, it is a top choice for furniture and cabinet makers around the world because it’s so smooth and easy to work with. It makes use of construction waste and is a more affordable building material that can last decades if it stays dry. MDF is great for furniture but it doesn’t do well with water. Since it’s so dense, strong, and affordable mobile home builders often use it as sub-flooring. Unfortunately, it soaks water up like a sponge if it hasn’t been coated or had laminated paper applied to it. Many homeowners have experienced swollen and warped floors which is why mobile homeowners aren’t big fans. Related: Learn how to paint vinyl walls in mobile homes here. Is Your MDF Coated with Melamine, Veneer, Laminate, Thermofoil, or Just Paper? MDF doesn’t have a grain so a thin material must be applied to it that has been printed in a solid color or to look like real wood. There is a lot of confusion about this thin material. If your home is newer or had upgraded cabinetry installed your MDF cabinets may have a veneer, laminate, melamine, or Thermofoil over them. New manufactured homes have DuraCraft cabinets that are coated with a ‘proprietary PVC vinyl single-ply laminate material.’ This is where the confusion begins. Clayton Homes used MDF cabinetry with paper wrapping in most of their homes until 2018 when they began using DuraCraft cabinetry. Laminate is a more expensive material but it stands up against water and wears better than most of the other options. For high-pressure laminate, they use a 4 step process: soaking sheets of wood-grain or solid printed paper in a plastic resin, letting them dry, layering them, and then thermosetting it all together. The sheets are then cured using 1200-200 psi pressure that creates a very smooth and durable surface thus the name high-pressure laminate. More expensive laminates may use plastic or foil instead of paper. 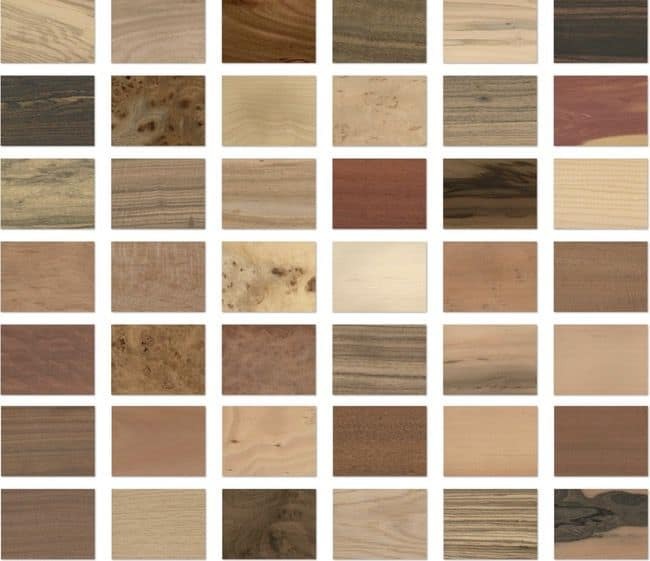 Melamine is also called direct or low-pressure laminate because it’s created the same way as laminate. They take sheets of paper and soak it in resin solids to create a plastic-like surface using thermal fusion. Melamine is much thinner than laminate so it only requires 300-500 psi to adhere it to the MDF. It typically only has a 5-year lifespan. Veneer is made from real wood so it’s more expensive but longer lasting. A tree is peeled creating a very thin sheet. The sheets can be layered to create a stronger thicker material that can be stained and even sanded. Thermofoil is made by heating and molding vinyl to the MDF in a special vacuum press. It’s the most affordable option of the four and offers a smooth durable surface. 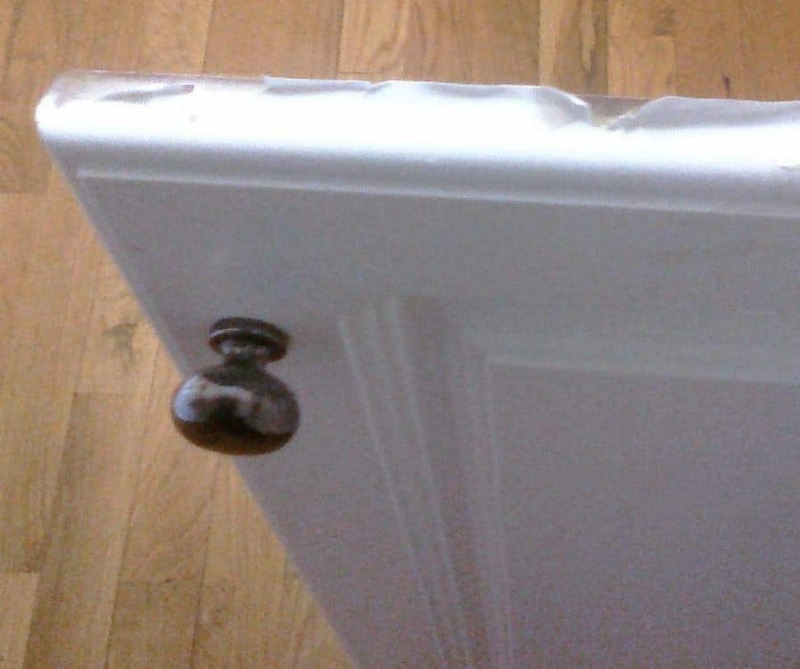 Thermofoil is prone to delaminating and peeling around the edges of cabinet doors. 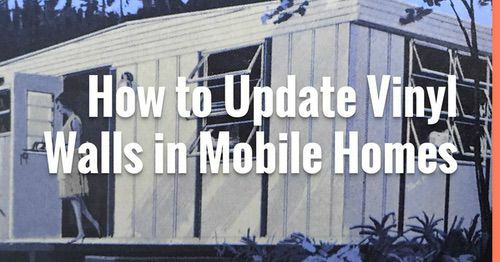 Now that we’ve covered the materials used in the majority of mobile home cabinets it’s easier to understand how to repair them. Before you can paint mobile home cabinets you need to have a healthy surface. 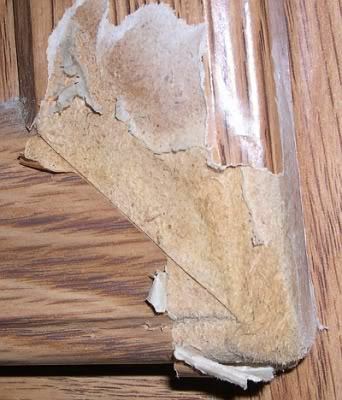 Unfortunately, MDF with laminated and paper coatings are prone to peeling and crumbling. Older MDF cabinets often have large pieces missing. 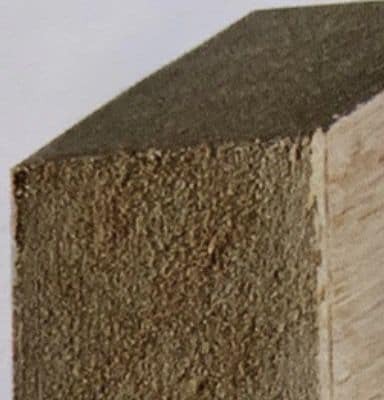 The images below show the most common kinds of damage suffered by MDF mobile home cabinets: simple laminate or paper separation and actual damage of the MDF such as crumbling or missing edges. Luckily, we’ve found the best method of repair for each type of damage. While the MDF itself is strong and long-lasting, the paper or vinyl coatings isn’t as durable. The paper wrap tends to peel or curl around the edges. 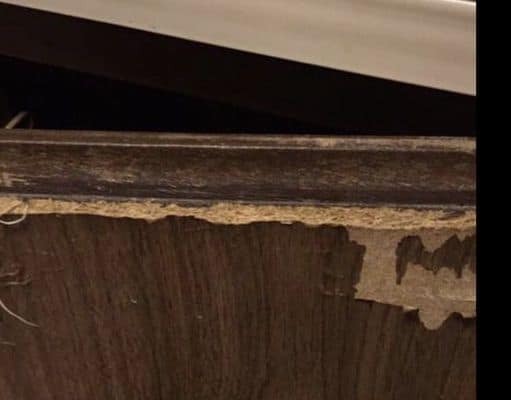 For mobile home cabinets with simple paper or laminate that is peeling like the image below you’ll want to repair it before it gets worse. 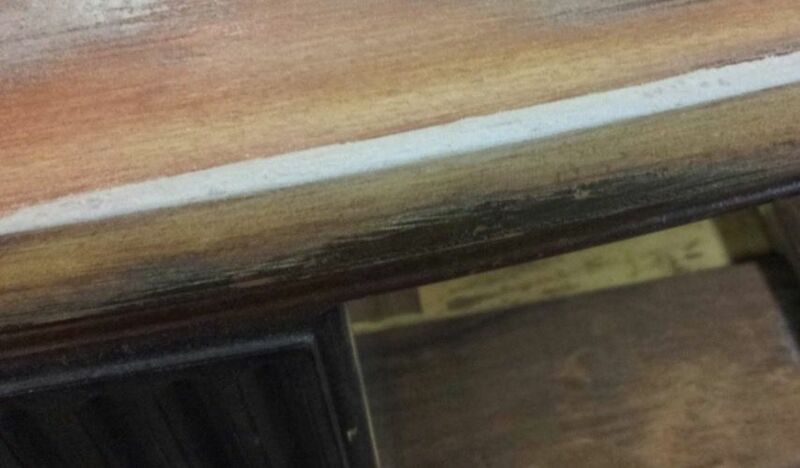 If the peeling is extensive and visible you will probably want to paint or reface the cabinet. You can also try finding a paper with the same color and design or color-match paint and draw the grain designs yourself to replace the area you’re cutting away. Either way, you’ll need to remove the loose paper first. To remove the paper, use an Exacto knife to carefully cut away the loose paper without cutting into the MDF. You’ll want to keep the cut square and cut back enough to that the new edge adheres to the MDF well. Cutting in a square or rectangle shape will make it easier to glue a matching piece of paper in the area you just cut away. Find a matching paper with the same colors and wood grain design will be difficult but it isn’t impossible. A good place to start is the scrapbooking section of Etsy, your local craft and paper store, or Amazon. To adhere a new piece of matching paper most pros recommend contact cement, just follow their directions. 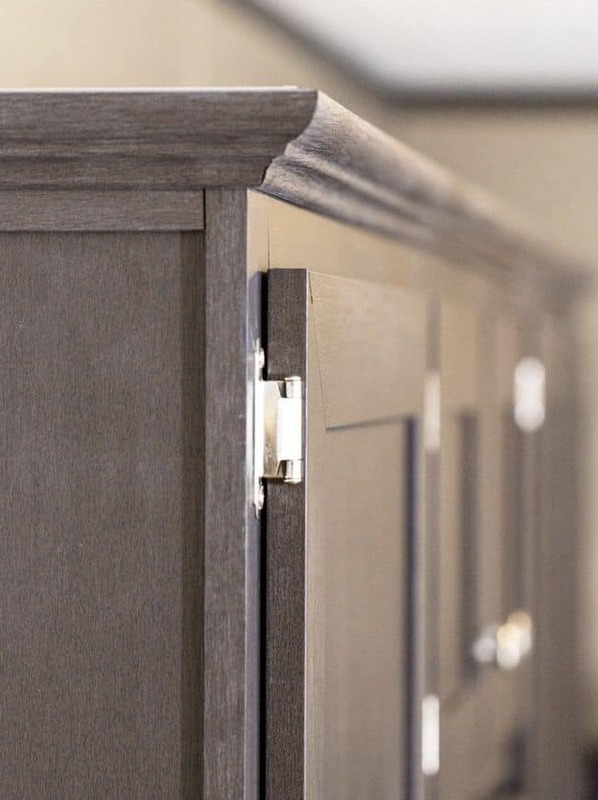 For cabinet doors that just have damage on flat edges you can add a new veneer edging. For small areas, you may just need to use a cabinet touch up kit. This works best for single color cabinets or areas that aren’t as visible. Paint in the base color first and create darker wood grain lines. In this case, you can sand the paper down to create a smooth feathered edge without damaging the paper wrap further and then use a self-leveling bonding primer to prepare the surface for paint. The second option would be removing the rest of the paper from the door so you have a smooth surface to paint. A heat gun works well to melt the adhesive on the paper so you can peel the rest of it away. Once off, lightly sand and prime before painting (instructions below). 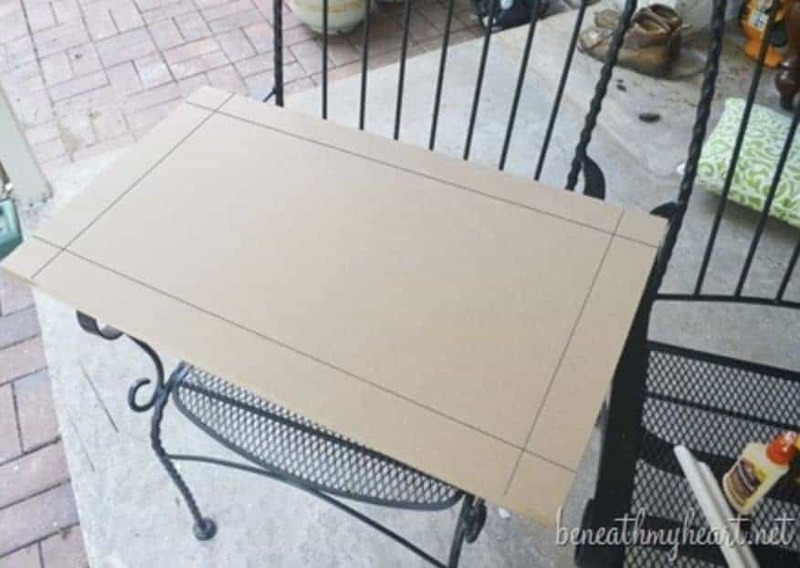 Home Depot recommends that if your MDF cabinet door just has a slight peeling of the laminate or Thermofoil, like the image to the left, you can glue it down with contact cement. If your older cabinets are crumbling around the edges or have extensive structural damage like the images shown you still have a few options. Cabinets like the ones below can be sanded but don’t expect the MDF to react like regular wood. You can clean the edges up a bit and give it a better shape with a medium grit paper. With really old MDF, one swipe with sandpaper is like 3 swipes on regular wood but you still may not get a smooth surface. Fortunatley, that’s where wood fillers and putty comes in handy. 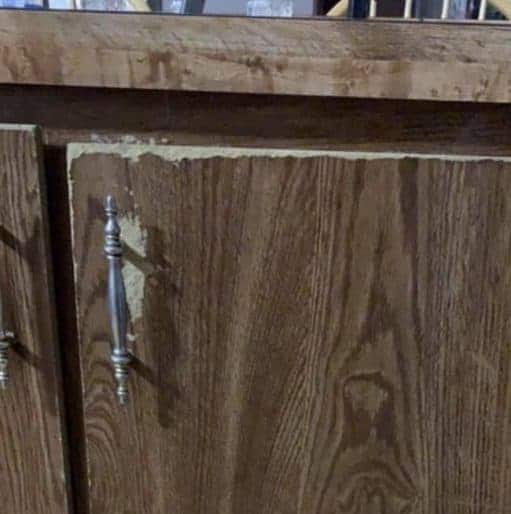 The most popular products used to repair MDF cabinets are wood filler, epoxy putty, and Bondo (yes, the company that makes automotive filler however they have a product for homes). We recommend trying the epoxy putty below first because it’s less volatile and easier to work with (you don’t need to mix anything). Bondo is a popular MDF amongst professionals. If you do uses Bondo to repair MDF use an oil based primer and then sand it with a 220-400 grit paper. To repair a mobile home cabinet with crumbled edges you can use the Bondo or epoxy putty, shown above. Roll out an appropriate amount of putty to fill in the missing MDF and let dry. Sand it to the correct shape. Prime and paint. 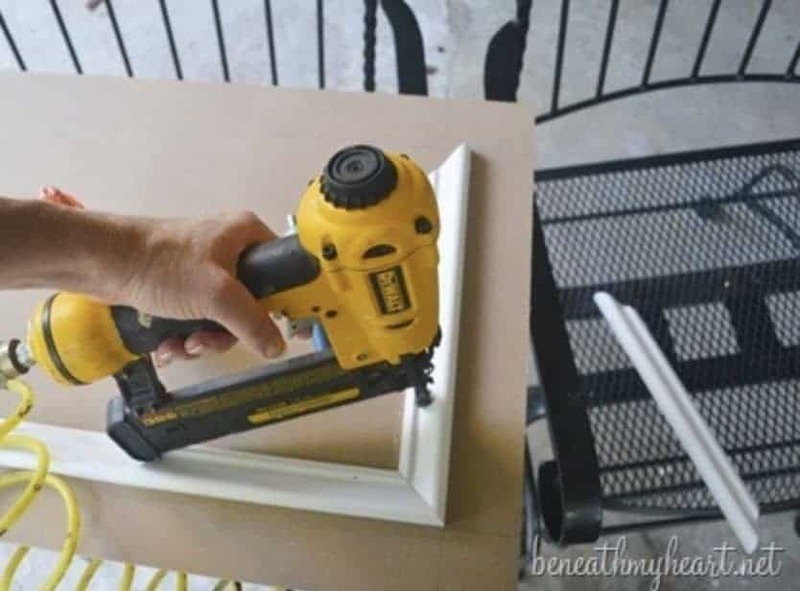 To use the wood filler to create large missing areas you need to give it something to hold on to which is why you see all those screws in the image below. Read more about the process at FaceliftFurniture.com. Check this link out to see more wood filler examples. Resurfacing mobile home cabinets can be simple or complex, depending on how much time, cost, and effort you want to invest. For cabinets that just have crumbling edges, you can add a shaker style frame to cover the damage like this blogger that glued free paint sticks from Lowe’s around her cabinet doors. 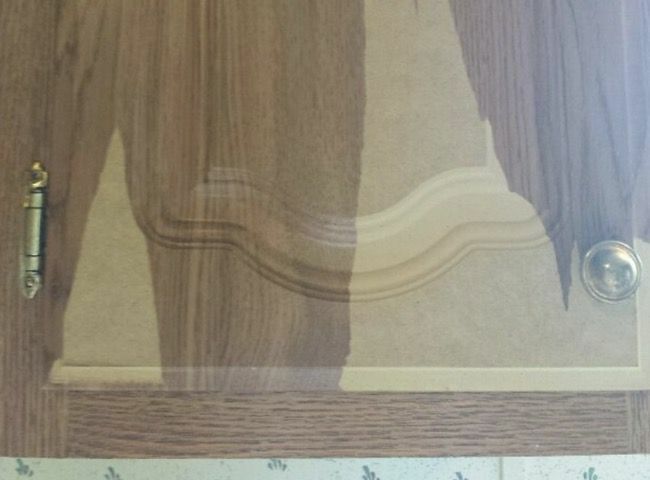 For heavily damaged cabinet doors you may want to consider covering it with a new veneer. If your cabinets have designs cut into them, you’ll need to fill them in with epoxy or putty or attach a thin piece of wood over it to create a flat and smooth surface that the veneer can adhere to. If you have a small kitchen, it may be cheaper and easier to just replace the doors instead of trying to repair them. Of course, you can buy new doors at Lowe’s or Home Depot (I’ve seen them at the Re-Store too). However, the most affordable way to replace mobile home cabinet doors is to make your own. Beneath My Heart has a tutorial that will help you make your own kitchen cabinet doors here. Now that your cabinet surfaces are repaired and in good condition, it’s time to paint! The best tips we can give is to spend money and buy the best supplies you can afford. Better brushes, primers, and paints cost more because they are made with better ingredients and materials. The two favorite brands for brushes and rollers are Purdy and Wooster. Painting professionals always say that preparing the surface is the secret to getting great results when painting anything. This is especially true for kitchen cabinetry because you can’t see grease or small cooking particles and smoke that sticks to every surface. The primer and paint must create a true bond to the surface it is applied or it will peel and bubble. The only way to do that is to clean the surface extremely well and then clean it again. TSP is the most recommended cleaning agent for cabinets but a few bloggers say Dawn dishwashing liquid works just as well. This is a controversial step because some MDF laminates won’t need to be sanded because it can rip and tear the laminate. If you have newer cabinets with a paper wrap that is in good condition it’s probably best to skip this step. For shiny laminate or melamine skin over your MDF you may want to lightly sand it to give the primer better gripping power. If your cabinets are especially shiny you can also use a liquid sander to degloss the surface. Liquid sander doesn’t really sand the surface, it just removes the shine so that primer and paint grips better. Only sand with very fine sandpaper if it will help you achieve a smoother surface. Be sure to clean the surface again after sanding and use a tack cloth. 1st we used gray Gripper primer. We applied two coats of this. Then we used BEHR paint and primer in one premium plus. We used two coats of that also. This formula was recommended to us by the man at the paint counter at Home Depot. They will mix up any paint color as a sample for around $3.50. Trust me it’s well worth getting many samples before deciding on a color. I think I had around 10. The colors do not look the same after going over the primer! Priming MDF cabinets is important. 9 out of 10 pros recommend a gripping oil-based primer for mobile home cabinets. A self-leveling oil-based primer is good for cabinets that have small inconsistencies or denting. Click here for help choosing the best primer. Sanding between two coats of primer is industry standard. The sanding is done with a very fine sandpaper. Once the primer has been sanded and cured it’s time paint. Two light coats of latex paint is most recommended. Paint is definitely one of those ‘get what you pay for’ products, much like manufactured homes themselves. Using a sealant after painting your mobile home cabinets is a personal preference. Most pros don’t see a need for it if you’ve used the best paint and primer. Sometimes sealant can turn white paint yellow so be sure to test it out beforehand. The following tips are also recommended by painting pros. Tip #1 Remove the doors and hardware. There are small painter triangles you can buy to hold the doors off the ground a bit. Tip #2 Consider using a quality paint sprayer. I’ve had great results with the Wagner Spraytech 0529010 FLEXiO 590 HVLP Paint Sprayer. Tip #3 Use a paint additive like Floetrol. Tip #4 Strain the primer, paint, and the Floetrol well before using. See how Ace Hardware paints laminated cabinets with chalk based paints. Related: Get 7 more affordable mobile home kitchen cabinet makeover ideas here. If you follow the tips and tricks above you should have cabinets you can be proud of. The most important factors to ensure a successful painting project is cleaning the cabinets so that the primer and paint can create a tight bond to the surface and use high-quality products. 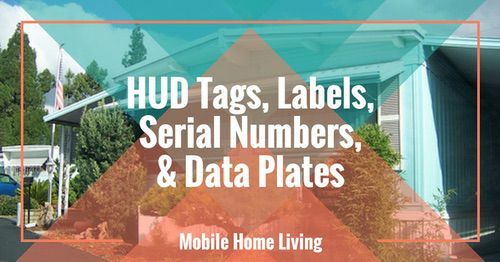 Learn what our favorite affordable decorating hacks for mobile homes are here. Have you repaired or painted your mobile home cabinets? We’d love to hear about them below or see them! 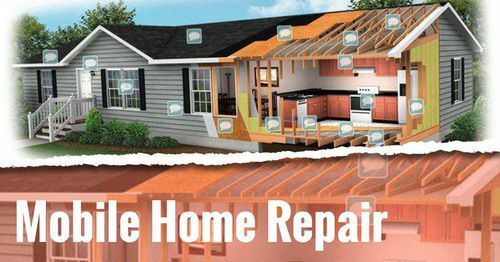 You can share your projects with us on our new Facebook group page, Mobile Home Living: Remodels and Repairs here. I love my mobile home and your site. I was raised in a brick house. 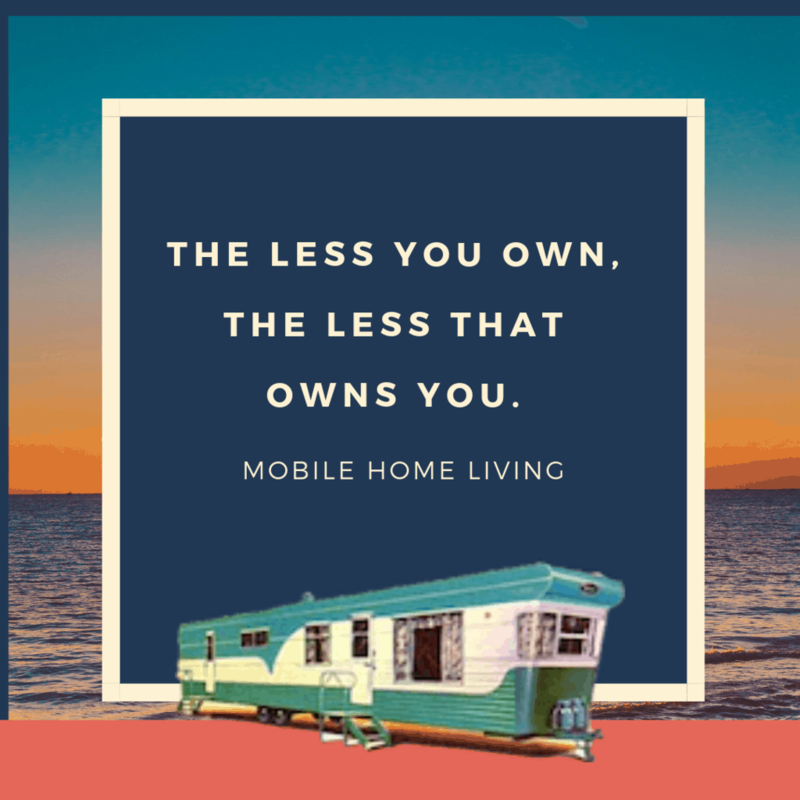 I saw my first mobile home in 1969 and fell in love with it. I live in a 14×70 1997 Clayton Mobile Home. Thank you for this site and all your helpful information. Hi Debra! Thank you for commenting. I always appreciate kind words!